College is indeed a shiny, fun experience for every student. As you become a part of Arya Engineering College, you learn new things and emerge out as an experienced individual after your graduation or post-graduation. Engineering Colleges and universities put in their best efforts to welcome students during the orientation process and address their issues all through college life. However, there are a few things we would want to reinforce so that you can make the most of your college/university life. Here are some essential things that every Arya student should know about its best engineering college in Jaipur. Experience a perfect and inspiring environment at Arya 1st Old Campus, which spreads over 10 acres of wide space. The University boasts of its state-of-the-art and modern infrastructure that facilitates a large number of services for the holistic development of students. Apart from its well-equipped classrooms, auditorium, laboratories, library, the University also takes pride in its Grand incubation center. Arya is one of the best engineering colleges. Located in the heart of the beautiful Arya College campus, the Library is dedicated to providing an extensive knowledge in various subjects with an aim to improve people’s lives through excellence in research, teaching, health care, economic development, and cultural enrichment. 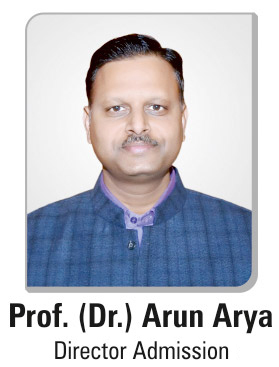 Students, faculty members, and staff of Arya have access to quality information through its vast collection of books, e-books, 3000+ electronic journals, and research articles. The Best engineering college in Jaipur collaborates with international universities across the globe. It aims to provide an unparalleled opportunity for students in terms of studying and working abroad. Arya International Centre offers a plethora of unique academic opportunities through industry-oriented courses and programs. It caters to the ever-growing needs of the industry. Students can enroll in summer courses and short-term internship programs abroad. Moreover, it gains international experience while enhancing their chances of hire by top-notch companies. ACEIT has a dedicated Training & Placement (T&P) Cell to provide extensive training before students appear for the placement process. Highest Placement College in Jaipur aims to motivate and guide students. With this, students can take an informed decision about their future career. With a focus on communication and interpersonal skills, leadership qualities, the training sessions also include technical training and one-on-one sessions. It considers the industry experts and faculty members. The University also encourages students to enroll for internships. It helps to build an effective resume while increasing the chances of getting employed by top companies. For the students having an interest in pursuing a rewarding career at Business and HR Analytics, the MBA Colleges in Jaipur offers one-of-a-kind executive courses. It designs by industry experts and professionals to cater to the growing needs of business leaders. However, with several industry-oriented programs taught by our mentors, you can gain in-depth knowledge and experience. Further, it will prepare you to tackle challenging situations at work.